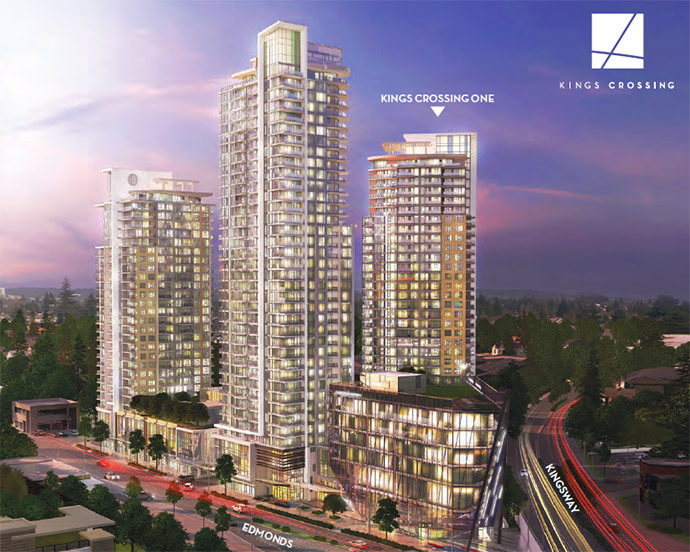 Introducing the Kings Crossing Burnaby Edmonds Condos! Preview: An exciting new condominium development is coming Fall 2015 to the Burnaby Edmonds Town Centre district. Brought to you by leading developer, Cressey, the presale Burnaby Kings Crossing One condo tower will be the first of three residential high-rises in this new urban centre complete with commercial space, new retail and lots of amenities. Kings Crossing One is also called the Burnaby KC1 Edmonds condo tower and prices will start competitively. There will be a great selection of 1 to 3 bedroom floor plans and the project site location is just steps away from the SkyTrain Station. Cressey presents the new Edmonds Burnaby Kings Crossing Town Centre. As in some of our previous articles, Cressey is one of our favourite boutique local developers with a huge track record of outstanding multi-family developments in the Lower Mainland. The new homes at the Burnaby Kings Crossing condos in Edmonds Town Centre are unbelievably priced and are all backed by this top builder. Kings Crossing by Cressey will give home buyers a coveted Burnaby address, the convenience of mass transit systems, street level boutique shops and dining options, views in all directions and an exceptionally built Cressey home without paying more than they should. This master planned Edmonds Town Centre community will consist of 3 towers and infinite convenience that will include office space and a wide array of floor plans that will range between 1 and 3 bedroom layouts. The Fall 2015 presales launch will be for the Edmonds Burnaby King Crossing One condo tower (first tower, which is also called Edmonds KC1 Condos). Home buyers will have the exceptional quality of living that comes with a Cressey built home and in the heart of the new Edmonds Town Centre. Some of the key features of the presale Burnaby Kings Crossing condo project by Cressey includes an exceptional location at the intersection of Kingsway and Edmonds in an established yet already transformed neighbourhood with new shops, grocery stores, cafes, dining options, yoga, community centre, top ranked schools and an enviable walkable location close to rapid transit with the SkyTrain just a few steps away. Homebuyers at the presale Burnaby Kings Crossing condo project will also get much more real estate value for their money and exceptional views that soar in all directions. The Cressey Difference includes well thought out floor plans, quality construction and finishings, ample storage space and amazing amenities onsite. At the time of publishing, the KC1 condo floor plans start with Unit 1A which is a 1 bedroom and 1 bathroom layout at 540 square feet. The larger Unit 1D one bedroom layout is 645 square feet. The two bedroom KC1 condo floor plans start with Unit 1E which is about 850 square feet and features two bathrooms along with Unit 1G at 800 square feet. A unique Edmonds Burnaby condo layout is the Kings Crossing Combo Unit Layout which features 3 bedrooms and 2 bathrooms at 1,174 square feet along with two balconies. The outstanding amenities at the Burnaby Edmonds Kings Crossing master planned 3 tower development includes a steam and sauna room, state of the art, well appointed fitness centre, a multi purpose gym with 2 flat screen televisions and a lounge and games room for residents. In addition, you can enjoy the outdoor amphitheatre for the ultimate movie night, quick access to local parks, services and shops that are within walking distance as well as great restaurants and cafes. 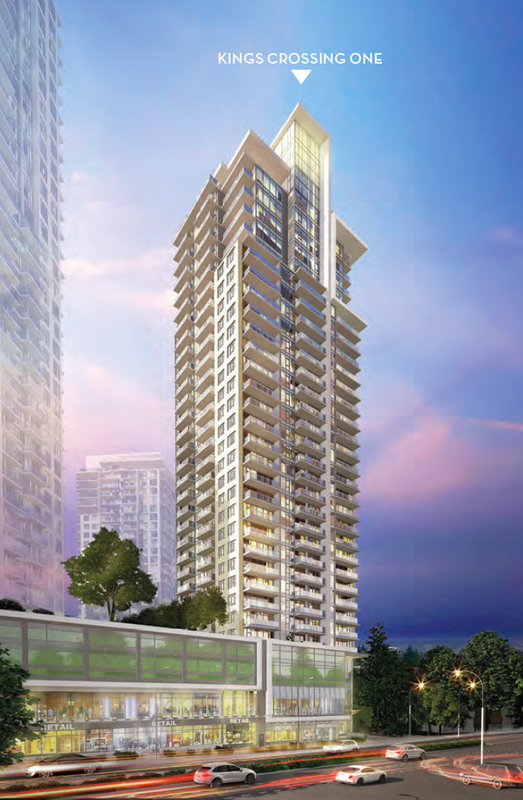 Kings Crossing Burnaby presale condos will also introduce a Concierge on site. The Burnaby South community where KC1 condos are located are very close to many great highlights including Highgate Village shopping and dining, Tommy Douglas Public Library, Edmonds Park, Edmonds Community Centre, St. Thomas More Collegiate School, Metrotown and Deer Lake Park. The Edmonds Kings Crossing One tower condo presale is set to launch presales with a deposit of only 10% upon writing, 5% on 6 months and 5% one year from the contract date. The Kings Crossing One condos is estimated to complete in late 2018. Most presale homes will include parking, with additional parking stalls estimated at about $20,000. 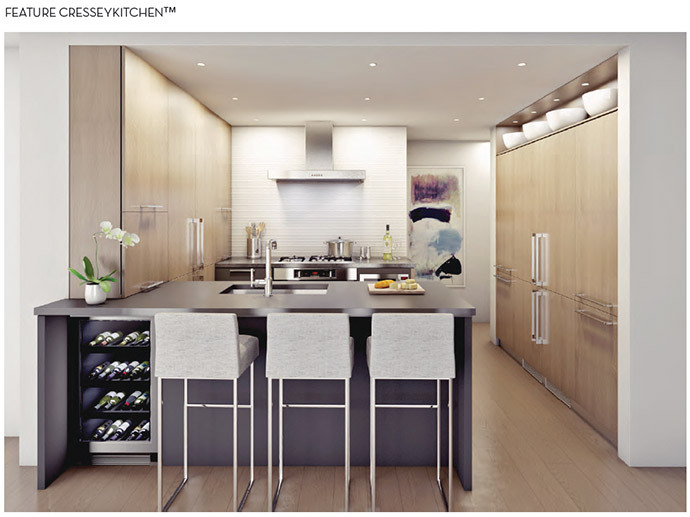 Cressey is well known for their outstanding interior finishes, layouts and unique features and the KC1 condos are no different. Sophisticated Burnaby South condos will be of concrete construction for long term durability and the project will feature stunning wide plank wood laminate floors in the bedrooms and all living areas. There are two classic colour palettes and a stacked front loading Whirlpool washer and dryer (energy efficient too). 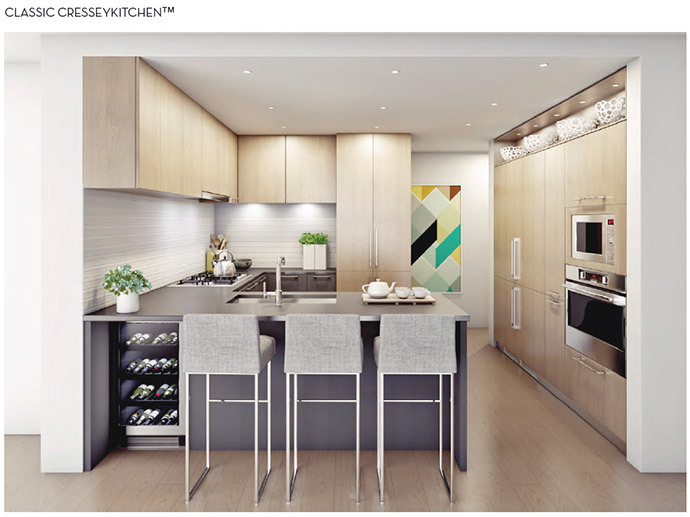 The CresseyKitchen has become synonymous with high quality and streamlined design for new homes and the presale Burnaby KC1 Kings Crossing Edmonds condos will feature functional walk through designs, lots of storage and seamless design details. The Kings Crossing CresseyKitchen will feature one of two kitchen layouts called Classic or Feature and they will include built in cutlery drawers, wood laminate and painted cabinetry with timeless hardware. The kitchens will also feature under cabinet lights, durable and easy to clean quartz stone counters with white ceramic backsplashes. There is a single bowl stainless steel sink with in sink disposal system asw ell as a fully integrated, energy and water efficient dishwasher with Quiet Wash System and Steam Finish options. The Edmonds KC1 Condo CresseyKitchen will also have a pro style stainless steel microwave, Fulgor wall loven, sleek low profile stainless steel hood fan with three speed settings and a 30” five burner cooktop with stainless steel knobs. The Cressey designed kitchens at Kings Crossing Edmonds Town Centre will feature a 48” integrated fridge by Blomberg with bottom mount freezer and four distinct temperature control settings in addition to a fully integrated Chef’s Wall system with key appliances at eye level. The bathrooms at Burnaby’s KC1 Condos at Edmonds Town Centre will feature marble counters and backsplashes in the master ensuite (along with porcelain tiled flooring) and quartz counters/backsplashes in main bath. The sinks will be modern with polished chrome faucets and there will be wood grained laminate floating vanity with under cabinetry lighting. There is also a floating backlit mirror and glass enclosed tiled showers in all master ensuites. Here are some reasons that Kings Crossing Edmonds condos is one of the best developments in the Lower Mainland: the Burnaby South neighbourhood is already a great community, the SkyTrain is within walkable distance, you get more for your money, outstanding 360 degree views and of course, the Cressey Difference. Visit www.kingscrossingbycressey.com today.